Oil on paper (mounted on panel), 39 x 49 cm. This artistically done mountain landscape shows that when Fritz Petzholdt was not creatively bound by a fixed commission, his brush strokes became freer and his choice of subjects became more personal. The foreground is quickly painted and appears unfinished. One can tell that Petzholdt has been more concerned with capturing the light and mood than rendering a detailed depiction of the subject. Petzholdt’s fingerprints can be seen in the foreground of the painting. Presumably, he hastily completed this work and did not allow time for the paint to completely dry before packing everything up. There is an unmistakable sense that the artist truly enjoyed painting this little study, which lends an energy to it. Thanks to the interest accrued on a large fortune, Ernst Christian Petzholdt had ample opportunities, over the course of his short life to travel a good deal more than many of his artistic contemporaries. 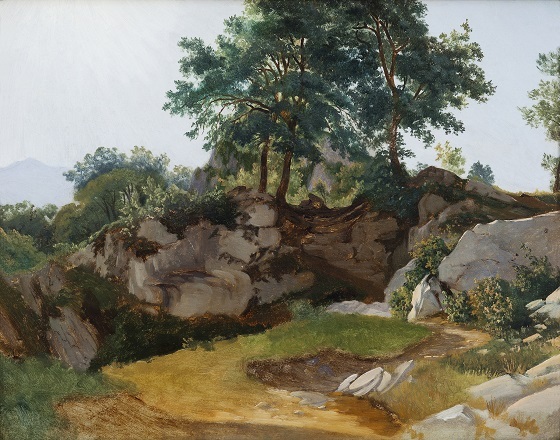 He is regarded as being the only true landscape painter among the Eckersberg School’s many students. Most of Petzholdt’s motifs derive from the time he spent in Italy, where, in the town of Olevano, he joined the German artist colony Casa Baldi. Influence on Petzholdt from German and other international artists can be traced in the classical expression seen in many of his carefully prepared large compositions. The evolution of his style over the course of the approximately 10 years that he worked is perhaps most clearly seen in a freer and broader brushwork and a noticeable development in his use of colour. Petzholdt enjoyed relatively high acclaim in his day and is said to have been influenced by, among others, the Golden Age painters Christen Købke and Jørgen Roed.